Join us on Sunday, February 11 at 3pm for the opening of our latest exhibit: CHUTZ-POW! The Art of Resistance. Attendees will be immersed in the real stories that inspired this comic book series, view never-before-seen process art, and engage in their own art-making process. At the opening, we will also be unveiling CHUTZ-POW! Volume III: The Young Survivors for the very first time. Several of the survivors whose stories are featured will be in attendance. This exhibit will also highlight the publication of our new Teacher Training Guide, which helps educators with providing contextual information about the Holocaust for their students and assists with using the CHUTZ-POW! comic book series in their classrooms. Tickets to the opening are $5, and free for students (with valid ID) and Holocaust survivors. 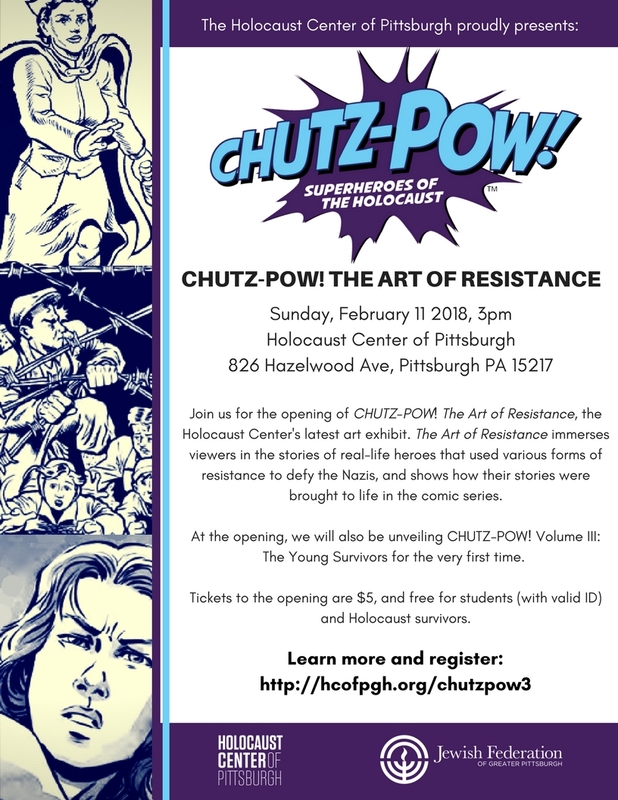 Also be sure to check out our sister exhibit at the American Jewish Museum at the JCC of Greater Pittsburgh, CHUTZ-POW! Superheroes of the Holocaust: Volume III, The Young Survivors, on display January 20 through April 9.